Wolf-hybrids are a popular fad in dog and exotic pet ownership over the last several years. Sadly, in most cases, the new owners are woefully unprepared for the ownership of such an animal. Wolf-hybrids are NOT dogs, and they do not have the same nutritional needs as dogs. This article will give you some basic information on the diet that will best suit your wolf-hybrid. 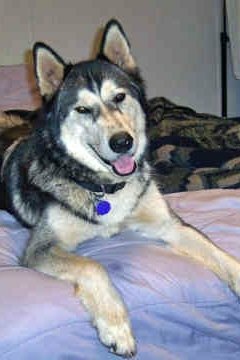 A wolf-hybrid, also called a wolfdog, will not do well on dog food alone. You cannot simply buy them standard dog kibble at the store and have them be healthy. Even the high-protein dog foods will not suffice. According to Nicole Wilde, author of "Living with Wolfdogs; An Everyday Guide to a Lifetime Companionship," you will need to supplement your wolfdog with fresh meat. Beef, chicken, fish, or even venison or horsemeat are all sufficient protein sources for your wolfdog. The meat needs to be fresh or frozen, and needs to be served in chunks to the animal. Do not mix it with the kibble, but supply it in a separate feeding once a day. Three pounds a day average will keep your wolfdog in top shape. If the idea of handling bloody fresh meat turns your stomach, there are frozen dog foods that supply the meat source in a less "raw" package. BilJac makes a frozen meat dog food that can be purchased at specialty pet stores. This will supply the high meat content your wolfdog needs without so much of the mess.